The text of Beelzebub’s Tales to His Grandson, originally transcribed in Russian, was subsequently translated, first into English and German, and then into French. The English (New York: Harcourt Brace, and London: Routledge) and the German (Innsbruck: Verlag der Palme) editions both first appeared in 1950, followed by the French (Paris: Editions Janus) in 1956. Later, translations into other languages were undertaken but these translations were based on one of the three published translations and did not enjoy the benefit of consulting the Russian. 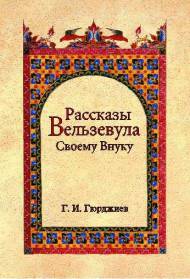 For those who read Russian, or for those who simply would like to have a copy of	this handsome publication, Beelzebub’s Tales in Russian is available from TRADITIONAL STUDIES PRESS.